Years ago, my first child was a little less than a year old and we were hitting a rough patch. Every hour of every day was filled with thoughts of "Is this normal? He's never done that before! Is he supposed to do that? What am I doing wrong?!?!" So I checked every parenting book I could find out of the library, which is generally how I deal with the unknown: I read a lot. And I mean a lot. Stacks and stacks of books. And any of you with kids know there is no shortage of people lining up to write tomes on the best way to raise, sleep-train, feed, play with, teach, and potty-train children, many of which contradict each other, of course. I slowly made my way through the mound and the books were all helpful to varying degrees. Except one. I honestly don't even remember its name. Which is probably a good thing for its authors, otherwise I would be badmouthing it right here, right now. The entire attitude of the book seemed to be "If you're not doing these exact things right now the way we say you should be doing them, your child is doomed to a life of second-rate musicality, never learning another language, constant depression and anxiety, an inability to ever make friends, and they'll probably grow up to be a murderous psychopath, too." Ok, so maybe it wasn't quite that specific, but on every page the authors warned that if I didn't start doing this before my child was three months old, I'd missed the boat. Or as soon as the baby rolled over I needed to start this particular game or it would be ten times harder for him to learn this vital skill. After a couple of chapters of this (and remember, my child was already past many of these vital formative milestones) I closed the book and literally threw it across the room. Since I had already irrevocably stunted his potential, according to these authors, there was absolutely no point in reading any further. Ugh. (Plenty of guilt comes with this job as is, I'm not going to voluntarily sign up for more!) So when Ms. Skenazy described parenting experts in her introduction as a "breed [that] seems to exist only to tell us parents what we're doing wrong and why this will warp our kids forever," I could totally relate and appreciate how refreshingly different Ms. Skenazy's approach is. I agree with Ms. Skenazy that "Mostly, the world is safe. Mostly, people are good. To emphasize the opposite is to live in the world of tabloid TV. A world where the weirdest, worst, least likely events are given the most play. A world filled with worst-case scenarios, not the world we actually live in, which is factually, statistically, and, luckily for us, one of the safest periods for children in the history of the world." And by extension, when we raise our children to be afraid of "the big, bad world" - that doesn't really exist - we are crippling them and their ability to function in the mostly safe, mostly good, real world. Instead of teaching them outdated useless platitudes that just serve to help us feel better, we need to teach them skills that will actually help them be safer and more empowered. For example, Ms. Skenazy declares, "'Don't talk to strangers' is one of the most useless pieces of advice ever foisted on us to foist on our children." Rather, we need to "teach kids NEVER GO OFF WITH STRANGERS, even if those strangers say they have something nice to give you or need your help or were supposedly sent by Mom." Of course, our children need to be able to talk to strangers! Everyone is a stranger before you've met them! Not being able to talk to strangers will greatly diminish our children's social skills and may even make our children less safe in certain situations if they cannot approach those who would be able to help them (like if they are lost, for instance). Another important lesson: "Teach your children, including your teens, that they have a right to say NO to anyone who wants them to do anything they don't want to do (except homework)." We all want our children to be obedient and respectful to authority figures, often (if we're being totally honest) because we feel that it reflects well on us as their parents, but there are those few authority figures who will take advantage of that ingrained obedience. Our children need to know that if they are uncomfortable, they can say "No" and we will support them, and help them work through the situation. A lot of the differences in parenting styles boil down to our perspective on what the ultimate goal is. Again, I'm with Ms. Skenazy that "raising happy, responsible, independent young people is parenting's goal." It seems, however, that the fear some parents experience is focused on a "hyperconsciousness" of any danger that might be lurking anywhere, and an opinion that "any risk is seen as too much risk," where the goal is to control the environment to the point where our children are always safe and happy, above all else. But as Ms. Skenazy points out: "Control is a figment of our imagination. Seeking it only makes us more anxious. It certainly isn't required for good child rearing. 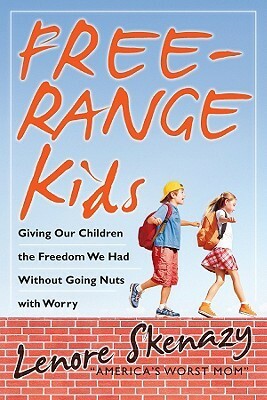 And to the extent that we do manage to solve all our children's problems--or keep those problems from ever even popping up--we are doing them a disservice...we are steering them away from the real source of confidence and independence, which comes from navigating the world and its surprises." Our children are often far more competent than we give them credit for, and we need to find opportunities for them to recognize and realize their own abilities. It's comforting to know that "there's a lot more leeway than we think when it comes to raising good kids...The whole Free-Range idea is that the twin notions of constant supervision and perfect parenting are not necessary...Our kids are not solely formed by our input, not will they be irreparably harmed by our bumbling oh-so-humanly along." That's a sane parenting philosophy I can definitely get behind. One of the quotes you included hits on an aspect of Mormon culture that I find particularly frustrating: the embracing of the "big bad world" trope that dehumanizes all of the good, decent people and experiences in the world. Its one cultural ideology that I have a hard time relating to. My strategy is to typically speak the truth as I see it (rejoice in the good, praiseworthy, etc, emphasize the commonalities between people, find the good etc). No one has called me on it yet but it does rather blatantly oppose the corrupt and disintegrating world idea that many Mormons seem to share. "Now, I want to be clear: I’m not one of those who thinks the world is a dreadful place and getting worse every day. With advances in medicine, historically low rates of violence, amazing technology, increased civil rights, better access to clean water, sanitation, and education, I believe the world is improving in many ways. President Monson has said, “This is a wonderful time to be on earth. While there is much that is wrong in the world today, there are many things that are right and good. There are marriages that make it, parents who love their children and sacrifice for them, friends who care about us and help us, teachers who teach. Our lives are blessed in countless ways.” (Thomas S. Monson, “The Divine Gift of Gratitude,” Ensign, November 2010)"
Love it! That's a great quote from President Monson as well and you incorporated it very well into your remarks. Sounds like you gave a great talk!